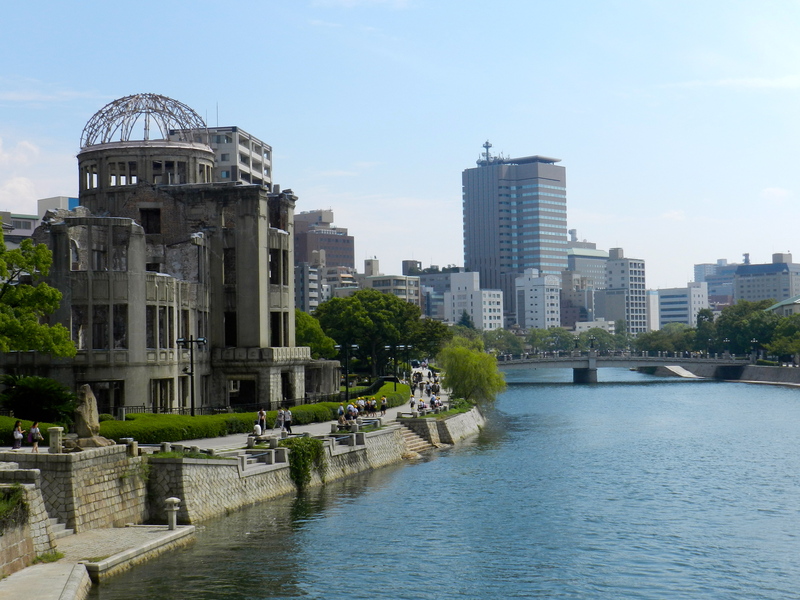 Hiroshima – Is It a Must See? I`ll admit it to you. 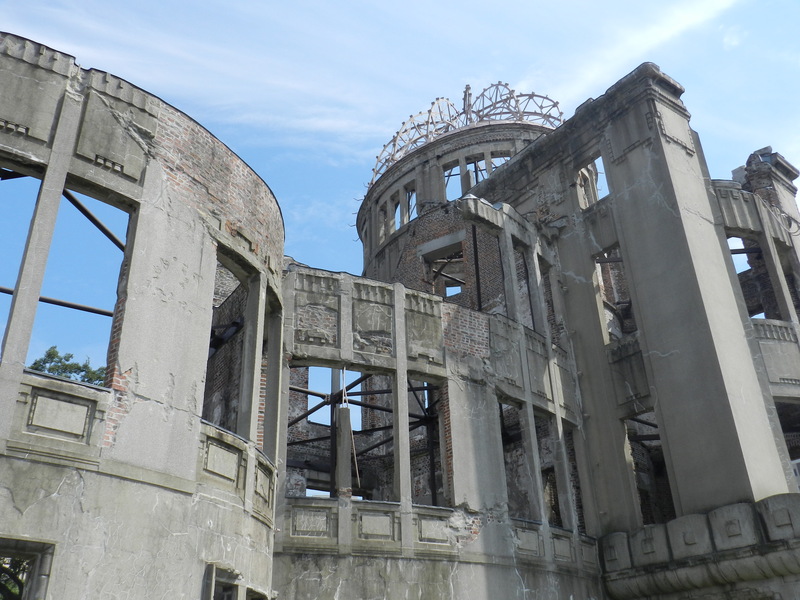 As much as I like to check off all UNESCO sites no matter how uninteresting some may be, Hiroshima was not high on my list of places to visit. As a UNESCO site it draws visitors from all over the world, but unless I could pass myself off as something other than American, I feared a hostile reception. I was more than happy to strong arm a visiting friend`s teenaged daughter to the site even though I`d avoided the trip myself. It was too late to back out when I realized I would have to be the one to take her. At 8:15, the A bomb was dropped and time literally stood still. We spent a lot of time looking at the only building to “survive” the blast which did so because it was directly under the bomb. Not much was left but remnants. Seen from the same position. The area surrounding the Hall was incinerated. 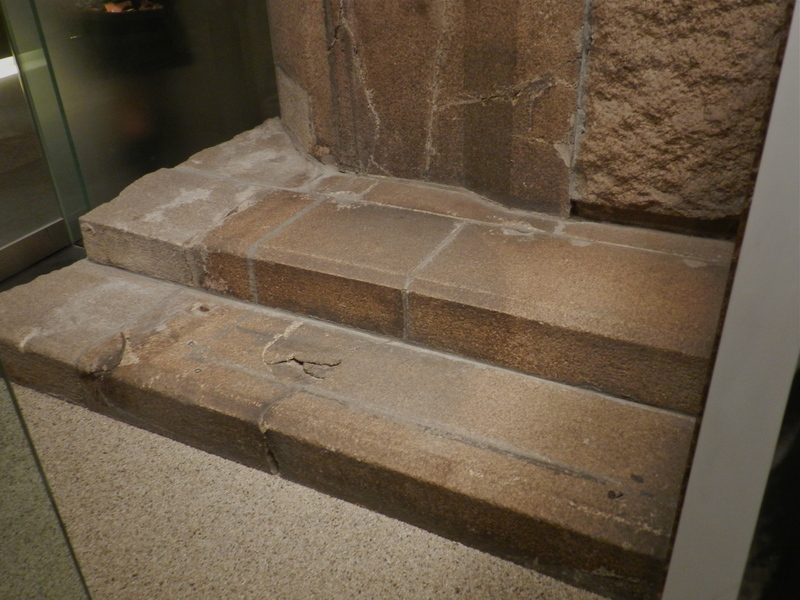 People were vaporized, leaving shadows to document their last action. Painting, walking, or sitting on a stair. 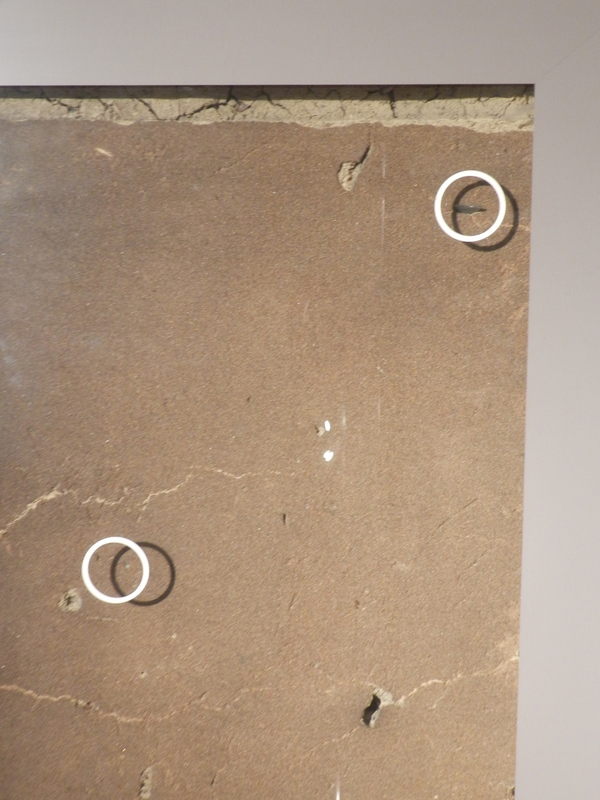 The blast embedded shrapnel in concrete. 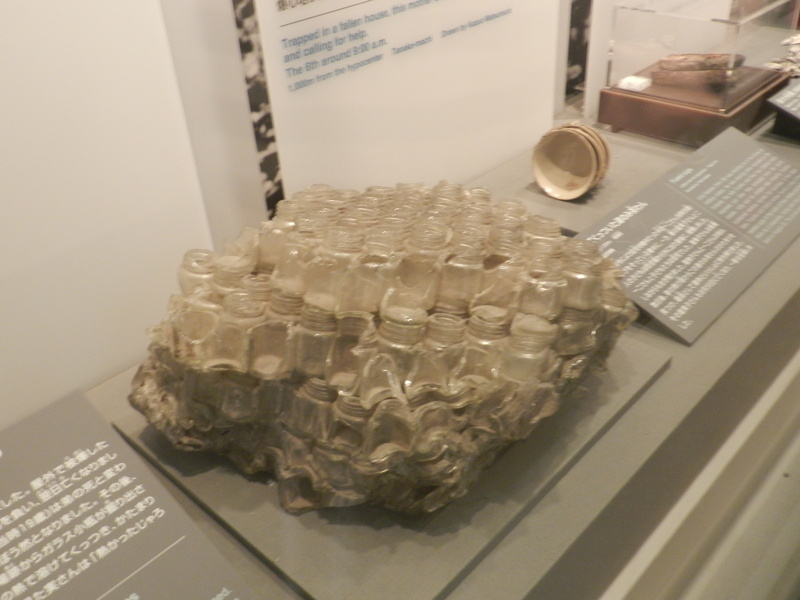 Cast iron, glass and ceramic roofing tiles were all susceptible. Roaming around the site were hundreds of school children. A group of three shyly approached to practice their English, starting with our country of origin. Once the others saw our smiles and friendly dispositions, we were swarmed whereas the foreign men with somber faces were left alone. Several laid origami wreaths made with thousands of cranes. 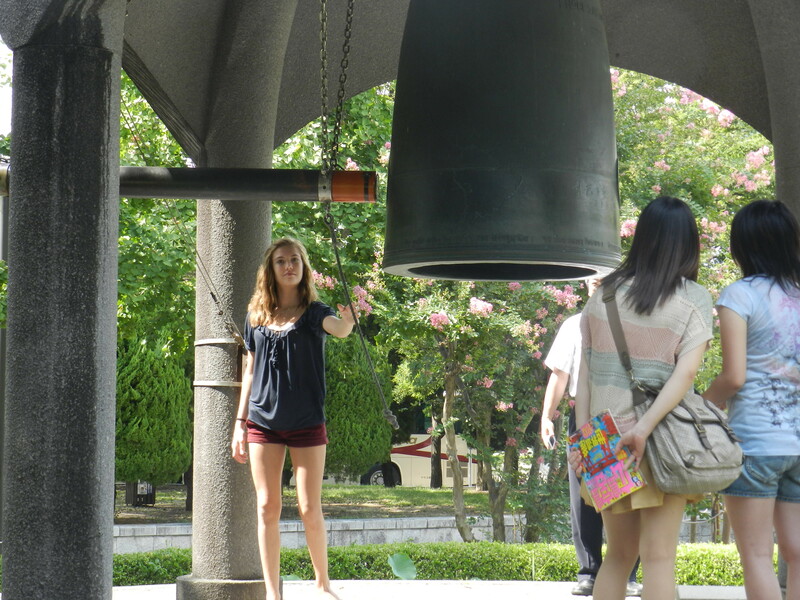 All the hundreds of children present rang the bell. It`s loud. So yes- it is a must see. Like other horific reminders of the past, this place reminds us of the reality around nuclear weapons at the same time telling a story of devastation, pain, and healing. 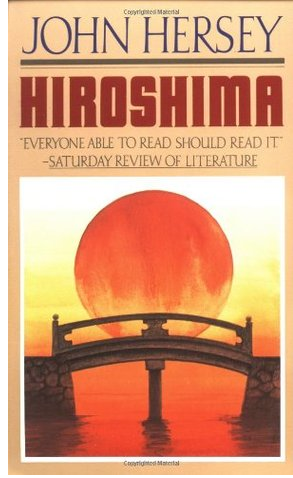 *** One of the best books on Hiroshima is John Hersey`s “Hiroshima.” Hersey tells the stories of 6 survivors describing that day in August 6, 1945. A truly compelling but easy read. 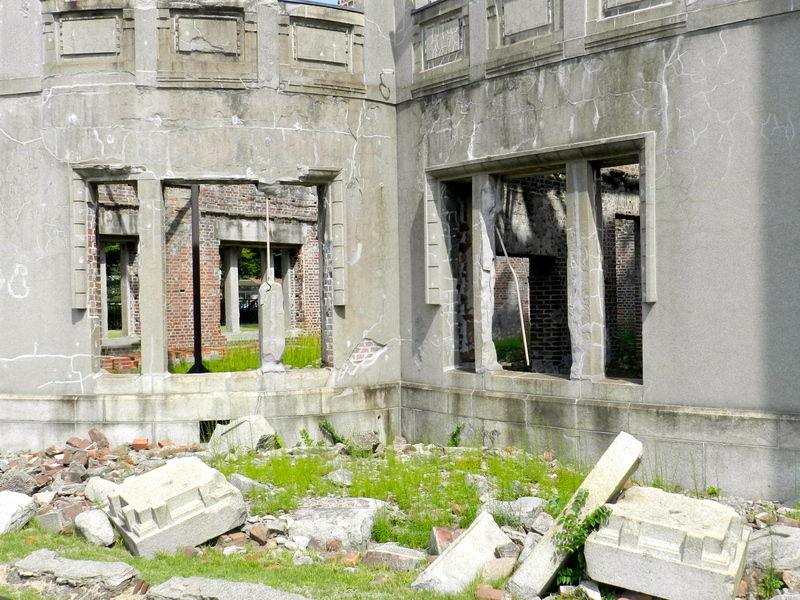 This entry was posted in Moving to Japan, Uncategorized and tagged Amblerangel, Culture, Emily Cannell, ExPat, Hey From Japan- Notes on Moving, Hiroshima, Japan, Travel, UNESCO. Bookmark the permalink. 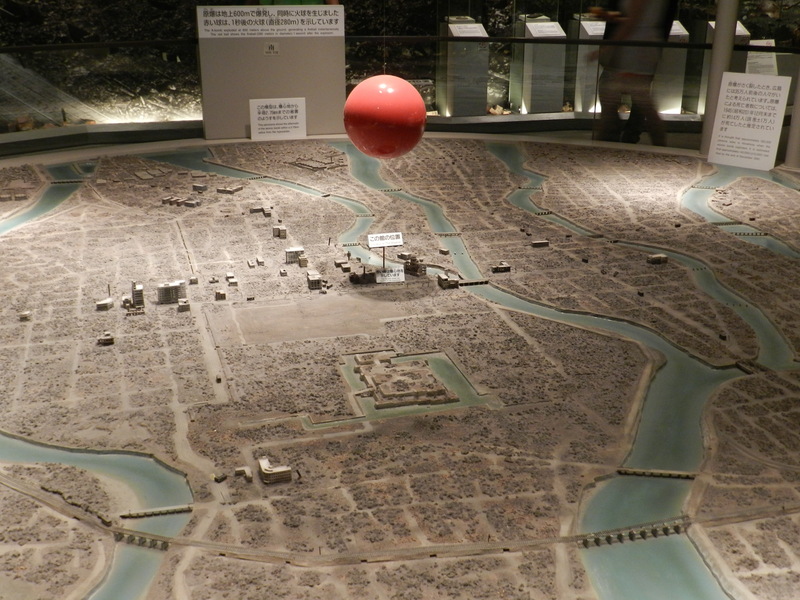 55 Responses to Hiroshima – Is It a Must See? Damn, this looks like a fascinating site to visit. Thanks also for mentioning the book. By the way, downtown Cuenca is an UNESCO site. When can we expect your visit? 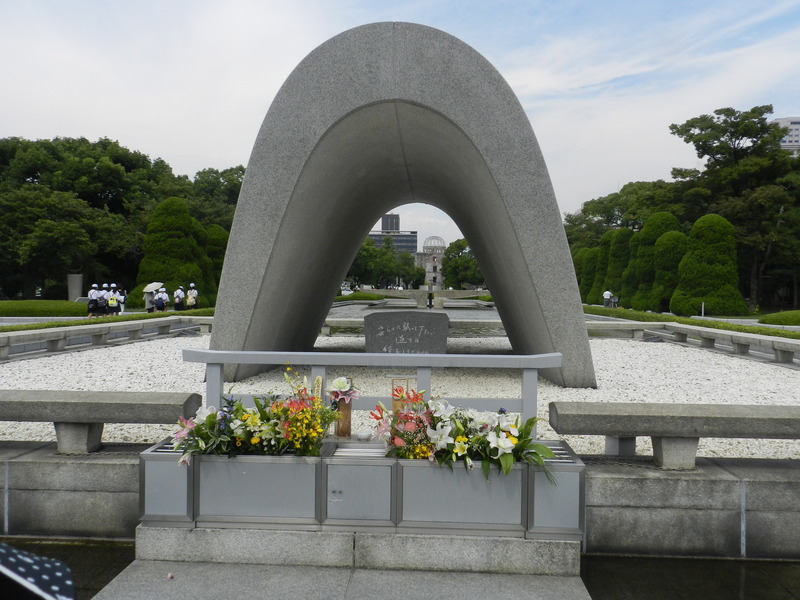 I’ve been to both Hiroshima and Nagasaki, and going to both Peace Parks is an amazing experience. The sad thing is that these towns are both wonderful places to visit, but because of what happen, most foreigner think they are very somber places. Personally, I loved the food. Did you go to Miyajima? Oh yea- those grilled oysters? And that meat kabob were YUMMY! Did you get harassed by the deer? The ones at Hiroshima just followed me around, but the ones at Nara were vicious! Thanks so much for sharing such a horrible piece of history. Lately, we’ve been having many discussion in our house about war and history,and how history (or anything) can be so slanted depending on who is telling it. I am going to get the book so I can be better informed (and have my boys read it when they are ready). How old are the boys- about 12? One of my kids read it in school for 7th grade- with a warning home to the parents! It doesn`t have pictures by the way.Thanks Lisa! They will be 11 in December, but much more worldly than I at their age! Enlightening blog post, some of the remnants are beyond anything I can imagine. Tempted to pick up the book you’ve mentioned now ! It really is good and not a long difficult read. Thanks for stopping in! 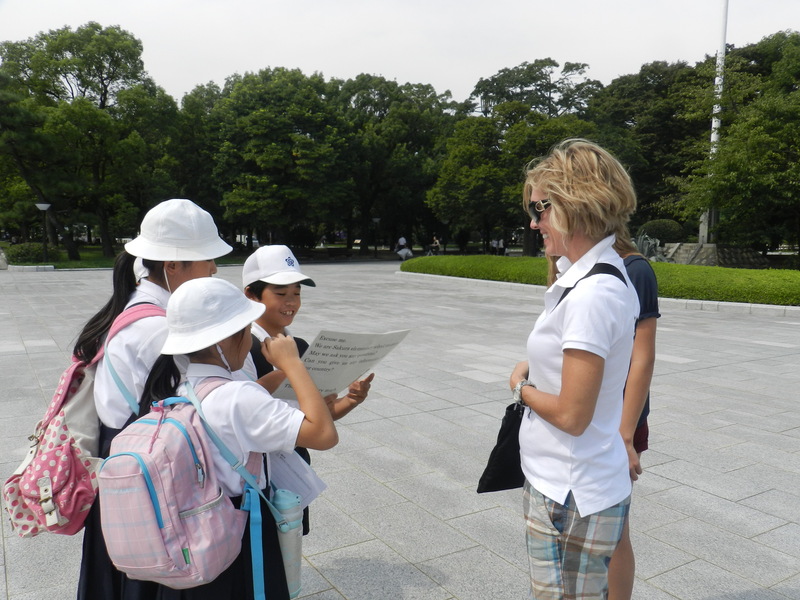 We have also been to both Hiroshima and Nagasaki. I think it’s a must-see, just as we visited the Killing Fields in Cambodia last Summer. 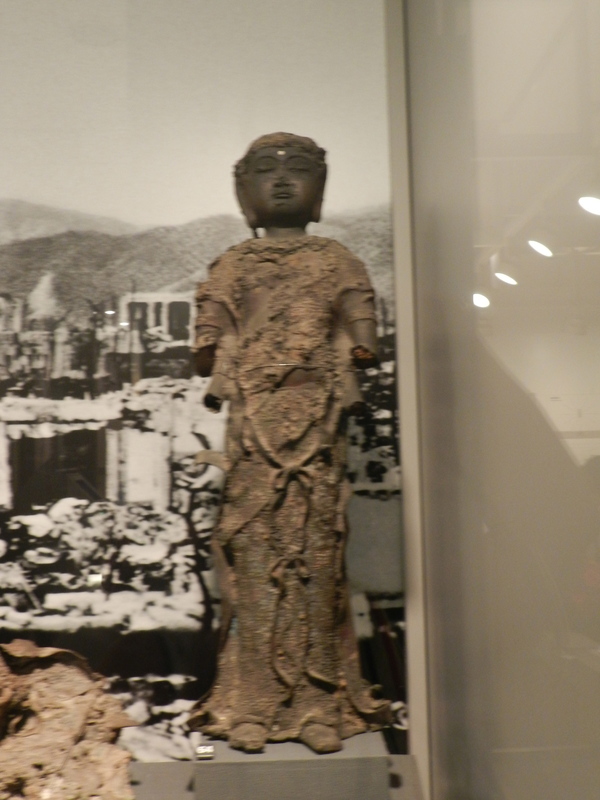 I found both Hiroshima and Nagasaki very interesting and impressive. Would certainly go back when we visit Japan again.. I thought you were going to Japan last year? Looks like you might have gone to Cambodia instead. I loved your posts from that- great pics as usual. Wow, I hope I’ll be able to visit one day. The shadows after vaporization really got to me. Yes, it’s simply so gruesome that somehow your mind can’t really grasp that such a think actually happened. I found a PDF file of the book, I’ll be reading it soon! 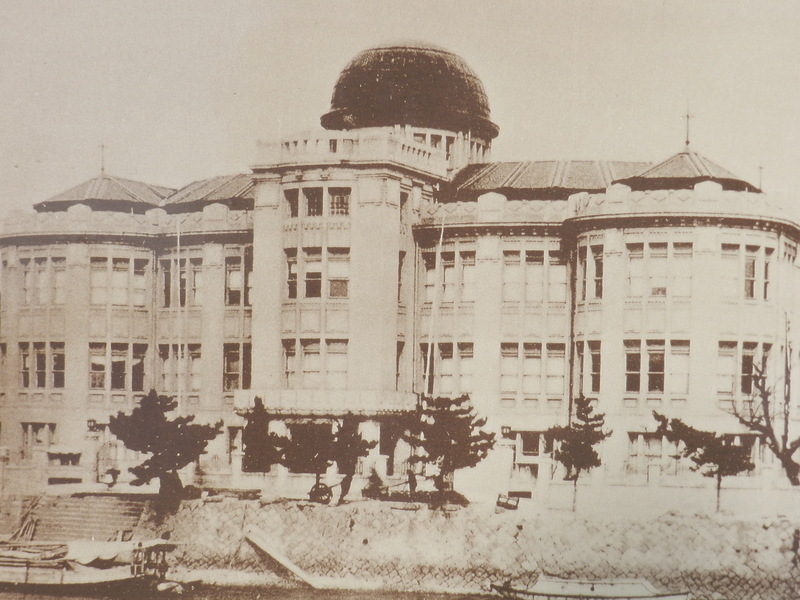 I visited Hiroshima when my Mom came to visit me in Japan. It was very somber. My mom felt very uncomfortable at the site. We went on to visit Miyajima after Hiroshima and that place was so beautiful! I think you did a post on Miyajima before. That’s a place I’d love to see again. I did to a post on Miyajima- it was a place I`d always wanted to visit. It is one of my favorite places in Japan- those grilled oysters are SO GOOD! Nice piece, Emily. I have found that all you need to do, no matter what part of the world you are in is to smile and say “G’day”, that way you show the locals that you are friendly and interested. 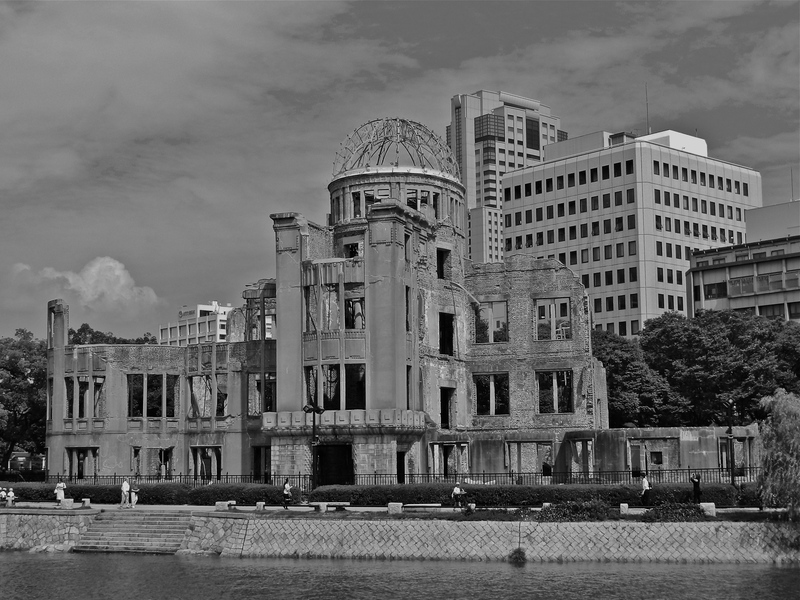 I have not been to Japan yet and Hiroshima and Nagasaki are high on my list to visit. I think both cities are examples of just how horrible people can be to each other and how resilient they are after what seems to be a complete and utter disaster. Thank you. G’day Emily, Having been to Canada, well Quebec, I must admit it was very hard to discover any signs of distinct Canadian Culture. However they are a very polite people and we do our best, when traveling, to raise the tone of the country we are in. Usually that is good fun. Great Post. I love the crane wreaths. 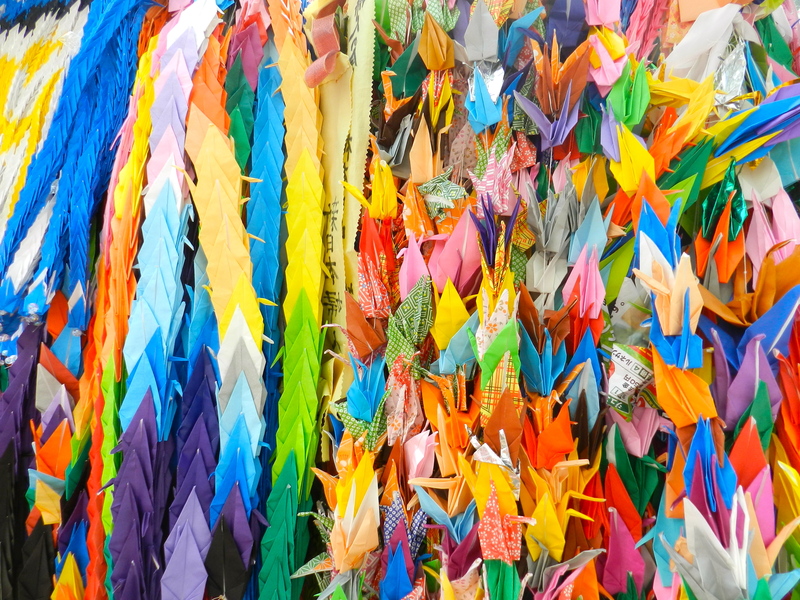 They must have a symbolic meaning because I often see origami cranes associated with tragedies. 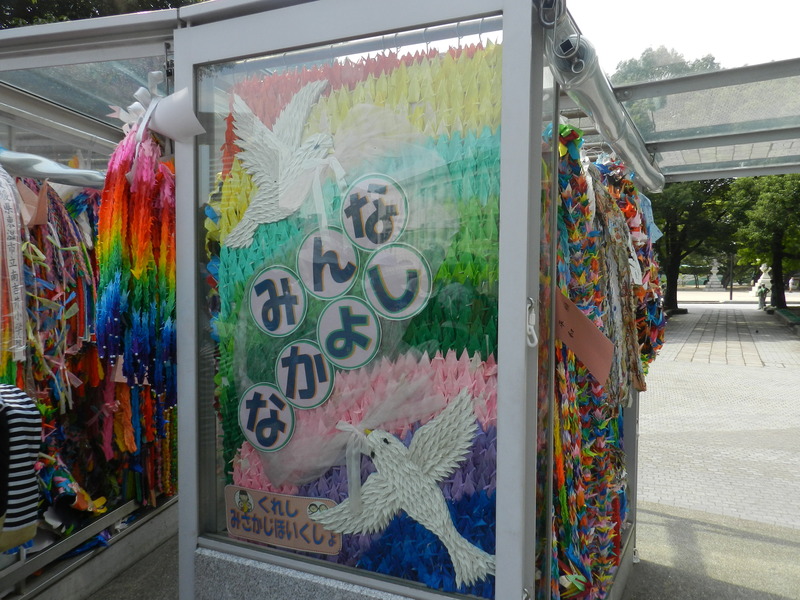 For example, after the earthquake and tsunami I saw fundraisers with origami cranes. I read the book. It is fascinating, tragic, eye-opening, moving- it really made it real for me. The crane has so many meanings in Japan but in origami it`s peace. Cranes are on wedding dresses (they mate for life) and included in all sorts of art. Very symbolic in Japan. YOU are the one who recommended that book to me! I thought it was really great. Excellent post, Emily. I’m so glad you shared this visit. I remember having similar concerns when I visited Pearl Harbor and saw dozens of Japanese tourists there. But they were friendly and open as you pointed out. People make peace much better than governments do. I think so too.Now if our govt could just make peace with eachother…. I definitely agree that people make peace much better than governments do. I wonder when will we/government learn that war is never has winner and that what we strive most to protect in the end are lost in the war. 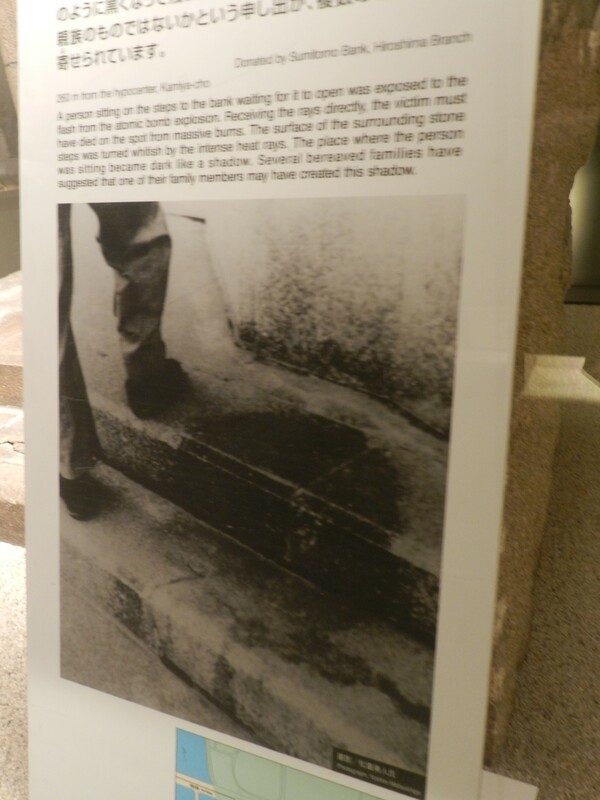 I’ve been to a handful of WW2 memorials and museums, and the one Hiroshima is one of the first that I suggest people visit. It carries a good balance between stating fact–what lead up to the decision, how people and the city were affected, what happened to the victims afterward–and pushing an agenda against the use of nuclear weapons world-wide (as opposed to simply guilt-tripping). I visited on my first trip to Japan in 2007, and went again this summer while my friends were in Japan for the first time. It really left a dark cloud over our day, but it was worth it. We also happened to arrive as a survivor was in the park telling her story. There are still some survivors which is astonishing to me. I thought it was well done. I agree- it was well done. That`s true isn`t it. I was just amazed at the reality of dropping a bomb like that and what it does- and the Cancer for years to come. Miss you too! Looks like you`re enjoying it! I’ve been there too, when I was 15 travelling alone. I think it’s a must see for people from everywhere, and every age. It is a true haunting image of aftermath of war and people couldn’t image how bad it can be (even movies can’t portray that) until you actually see the REAL stuff! I found that too. The people vaporizing and leaving shadows really hit me hard. An illuminating post, thank you. 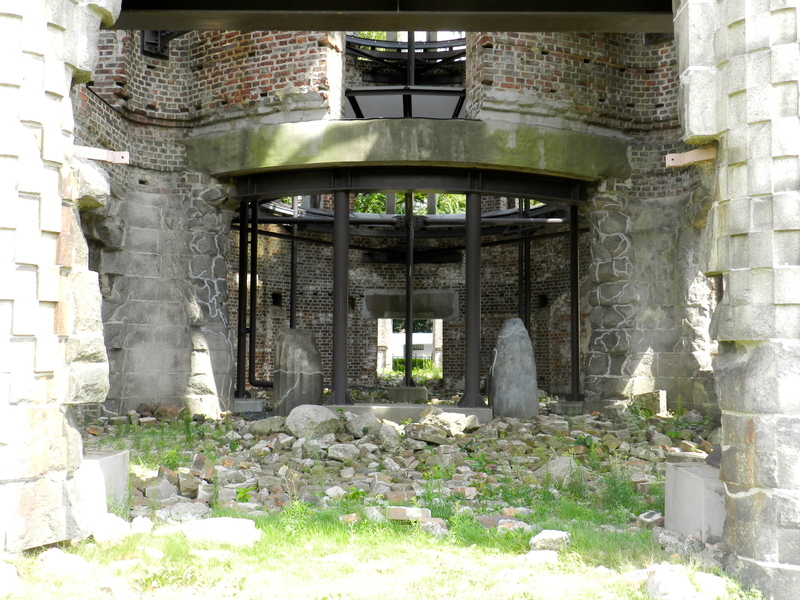 I have reservations about visiting places like Hiroshima and Auschwitz, one part wants to go to somehow acknowledge the suffering involved, but the other part feels like a tragedy-tourist – some kind of peeping-tom. The trouble is that the people who really need convincing about the cruelties and horrors of war are not the ones who go. I understand that. But- I`m so glad I went- and the kids too. It makes these things real and I think it stays with them- maybe causing them to act differently as adults. I found the people there very friendly and open. It is a beautiful city. Hi Emily, its really a great post. i think most of the people would like to visit this place at once. 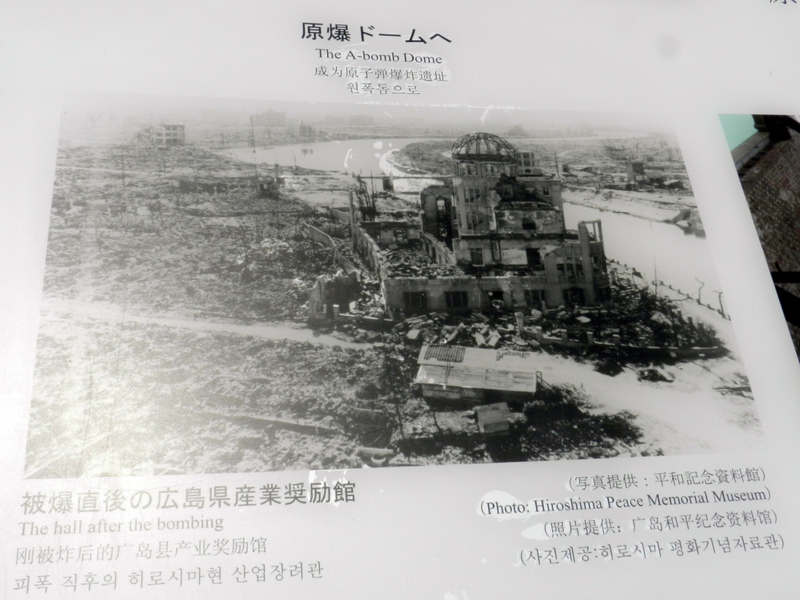 I wish it’ll not happen again like Hiroshima…. Fingers crossed. A very somber place…. Thanks for stopping in! 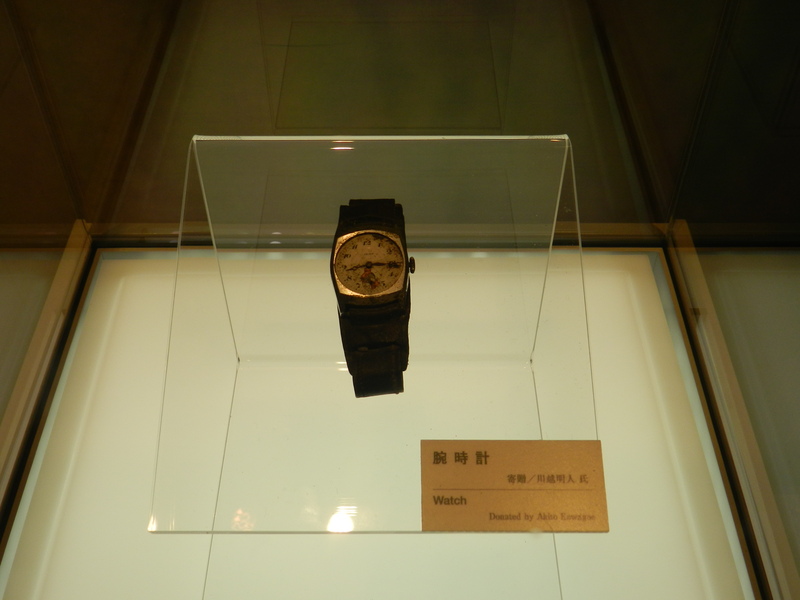 It seems you found some value in your trip to Hiroshima after all.. Which is good. The place has a lot of history and all.. But, I wonder if you were able to hang out with and talk to some of the locals? They’re quite chill down there and Hiroshima also has a cool bar scene, if you know which bars to look for… Did you make it over to Miyagima-guchi? It’s where the famous large orange Torii is..
Great post, Emily. I’m glad that there are sites like these. Even though it’s really difficult to learn about the horrors of history and to be physically present in a place like that, we become better people because of it. There is a synagogue in Prague that has the names of Czech Jews who were exterminated during WWII written on the walls in average-sized font. Those names take up the WHOLE SYNAGOGUE. Multiple floors– floor to ceiling. I bawled the entire time I was there, but I’m so thankful I got to see it all the same. I agree it is a must see. Your experience reflects that of many who go there. I have been there 4 times now, each time with different family members. While it is new to them and the experiences intense, going to any place a few times can get gradually duller. 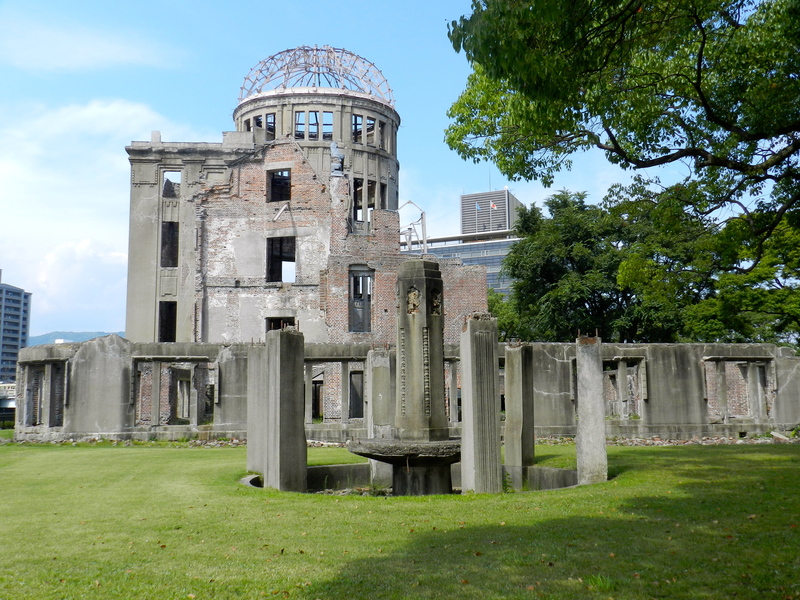 So I have made sure I explore not just the peace park area, but other sites in Hiroshima. A fifth visit is on in April, but just for 2 days. Each of our group has been there before, but we wil still go. I did love the special Okonomiyaki they make in the train station there! That is worth the trip alone! Loyd- thanks so much! Glad you enjoyed! Thanks so much! GOod to know- I`ll go and check it out. Thanks GG! Glad you liked it. Thanjs for your marvelous posting! I actually enjoyed reading it, you are a great author.